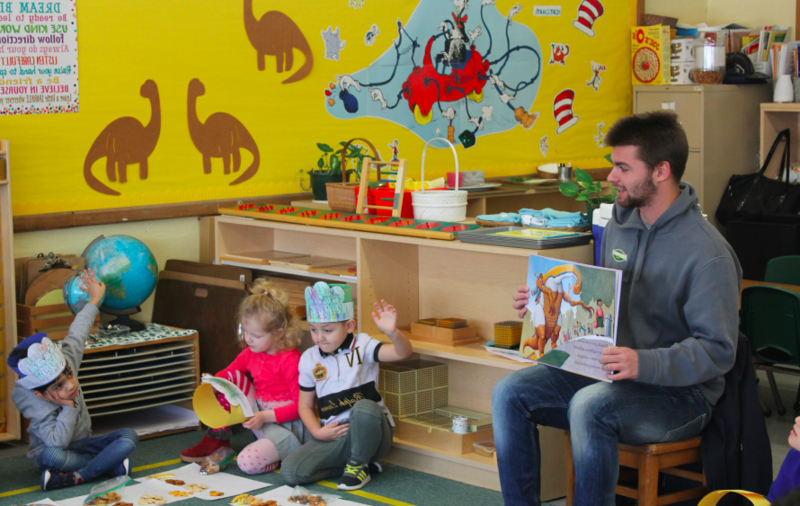 The men’s soccer team went to Huntington Montessori School to read books and lead soccer sessions for students between the ages 3 to 8 in the morning of Friday March 8. 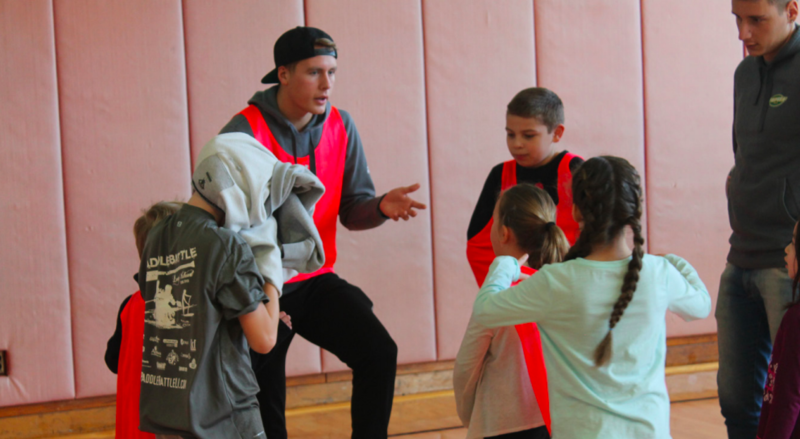 This was the second visit as part of a program called “Read, Run and Fun.” “It’s a mentoring program that is designed to get the players out in the community and to get them to interact with its youth,” head coach Michael Mordocco said. Arriving at the school, the players split up in two groups. One group visited the students in their classrooms, where they read to them. The other group brought students to the school gym for a soccer session where the kids ran around and played soccer-related games. 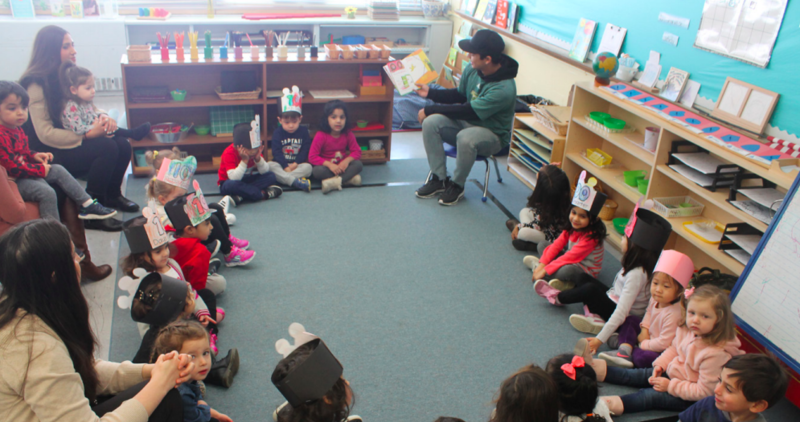 In the classrooms, the reading mostly consisted of Dr. Seuss books, as March is Dr. Seuss month, but the students also listened to stories about dinosaurs and Pete the Cat. Ajani, 6, was especially interested in the dinosaur books and their pictures. There was one particular thing he liked in one of the books the players read. “There was a big dinosaur head,” Ajani said. Six of the seven players who visited Huntington Montessori School are international student athletes from Argentina, Australia, Germany, Spain, Sweden, and Trini- dad and Tobago. Even though some of them have distinct accents, the communication with the kids ran smoothly. “It’s a great interaction! The kids love them,” Jeff Rodriguez, head teacher for a mixed group with 3 to 6 year olds, said. Rodriguez also thinks is nice for the students to listen to other voices, especially male voices. “I think it’s nice for them to interact with other men. There aren’t that many male teachers, especially kindergarten teachers, so to have the guys come in gives them a chance to experience somebody else and not just me or their dads,” he said. Junior physical education major Kyle Parish, a midfielder and defender, also thinks the experience has been valuable. “I’m trying to do physical education and coaching, so personally it’s a very good experience for me to see what I can use and improve on to further my education,” he said. He also likes the change of pace from the university. 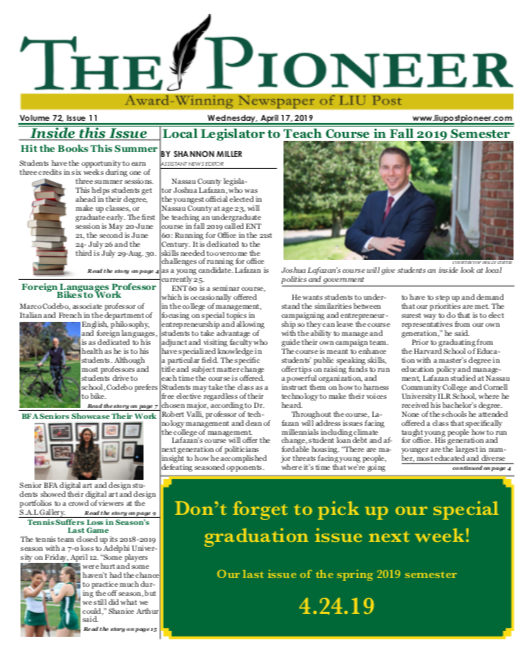 “To have a little bit of youth is very refreshing and joyful,” Parish said. Rodriguez would love to see the team come back, and he also thinks that more schools should invite university teams to interact with children. “I think this is a really nice experience not only for kids but for the team as well. I would really recommend this to other schools,” he said.